We install Concrete Floors, Stamped Concrete, Stained Concrete, Concrete Overlays, Epoxy Floors and do Concrete Repair all over the state of Maine! For over 30 years Day's Concrete Floors, Inc. has been providing central and southern Maine with the highest quality concrete floors, slabs, pool decks, walkways, stamped concrete, stained concrete and concrete repair. We are also trained Elite Crete installers providing epoxy coatings, decorative overlays, concrete resurfacing, repair to spalled and cracked concrete pool decks, stairs, floors and sidewalks. No project is too big or small, we place and finish concrete for basement floors and garage floors, we stamp concrete for patios, pool decks and floors, we stain and epoxy interior concrete floors and install decorative overlays to worn, cracked concrete. We take great pride in being able to provide you with the services and solutions you may be looking for when it involves concrete flatwork. We are your Maine concrete contractor for concrete floors and slabs, stamped & stained concrete, and epoxy flooring. Here's a 5000 square foot concrete floor we installed in Brunswick, Me. COMMERCIAL/RESIDENTIAL: concrete floors for general contractors & builders, some projects include Pizza Hut/Taco Bell, Credit Unions, Kennebec Savings Bank, Medical Centers, New Homes & Garages and Storage Buildings. STAINING AND DYEING: a method of coloring new and old concrete. It produces a permanent, mottled, marble like effect. CONCRETE SEALING: we can clean and seal your existing concrete to protect it from freeze/thaw related problems, stop it from dusting/chalking, give it an easy to maintain surface. INTERIOR CONCRETE FLOORS: polished concrete, stained concrete, or a decorative concrete overlay are a great way to enhance your concrete floor and use it as the finished surface. CONCRETE COUNTERTOPS: concrete countertops are unique, decorative, and hand crafted, they add a special effect to a kitchen, bathroom, or outside pool area. 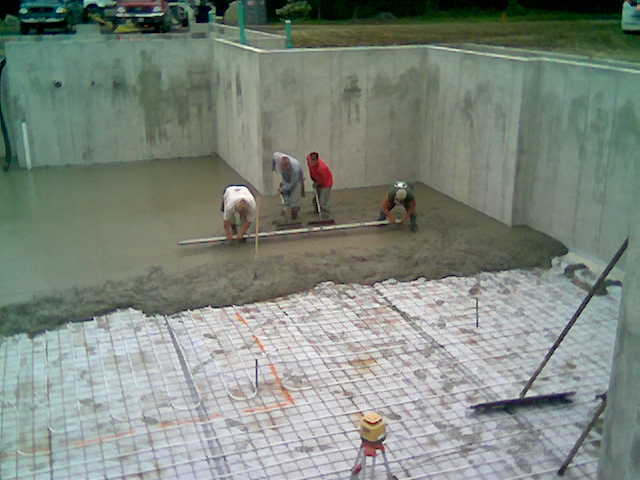 We pour and finish a lot of concrete floors in Falmouth, Me. 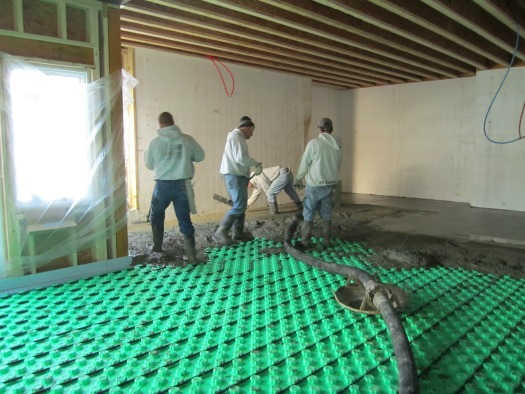 To install this basement floor we had to use a pump truck. Here we are in the basement of that house in Falmouth, installing the concrete flooring. Day's concrete floors, Inc specializes in all types of concrete flatwork. We've been doing concrete slabs and floors for over 30 years. We service central and southern Maine towns. 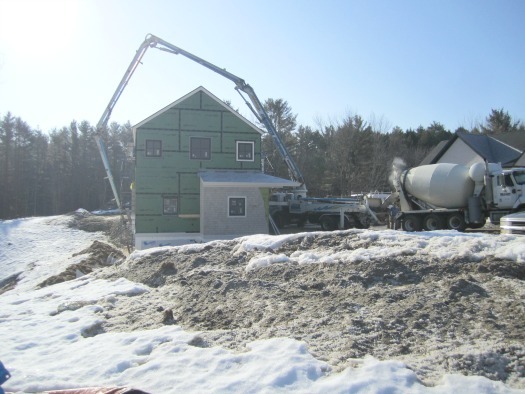 We install concrete slabs in Maine. We're located close to Augusta and Lewiston Maine. We install concrete slabs all over central and southern Maine. Stamped concrete in Maine is provided by Day's Concrete Floors, Inc. Stamped and colored concrete is a great way to make your patio, pool deck, or floor look decorative. 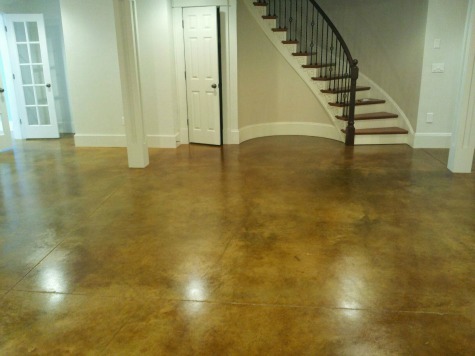 Concrete floor stain can be installed by Day's Concrete Floors, Inc. We provide stained concrete floors to central and southern Maine towns. 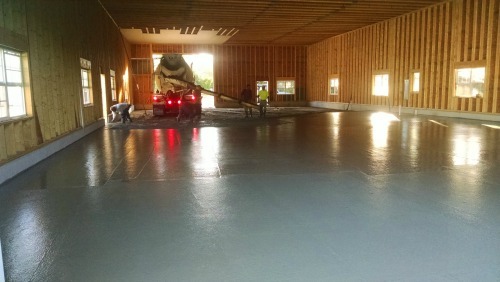 Concrete floor epoxy paint is professionally installed in central and southern Maine by Day's Concrete Floors, Inc.
We install reflector enhancer epoxy floors in Central and Southern Maine. 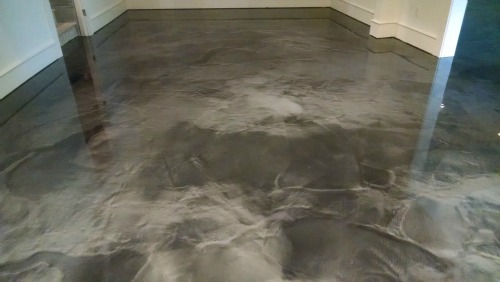 If you're looking for a metallic or decorative epoxy floor, contact us. Concrete Overlay and Resurfacing installed by Day's Concrete Floors, Inc.
A concrete overlay is a great way to resurface old, worn, cracked, and spalled concrete. Day's Concrete Floors, Inc is your Maine concrete resurfacing contractor. Concrete Repair in Maine - Sidewalks, Floors, Porches, Pool Decks, Driveways. Concrete repair in Maine is done by Day's Concrete Floors, Inc. We repair concrete sidewalks, driveways, porches, pool decks and floors. We also perform epoxy concrete repair. Color charts for decorative concrete include color charts for concrete staining, coloring concrete, epoxy floors and stamped concrete. We install concrete basketball courts in Maine. Having an outdoor basketball court is great for kids learning how to play basketball in Maine. This page lists reviews from customers who have hired Day's Concrete Floors, Inc to install their concrete project. This is my site map page for Day's Concrete Floors, Inc.
Watch us broom finish a concrete patio.